Create a buzz for your event or fundraiser by designing professional-looking tickets from your own computer. 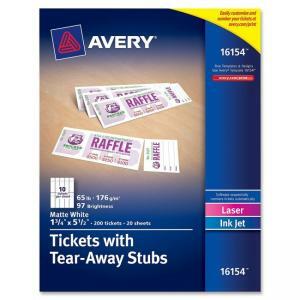 Customizable Tickets with Tear-Away Stubs are easy to print and offer a professional look, making them perfect for raffles, door prizes, dances, school and church events or fundraisers. Bright white, uncoated cardstock is printable on both sides. Personalize your tickets on one or both sides, and free online templates include automatic ticket numbering for easy record-keeping. The tickets separate cleanly after printing with no scissors required. Strong perforations on the stubs ensure they will stay put until your event. Letter-size ticket sheets are designed for laser and inkjet printers. Each 65 lb. sheet contains 10 tickets.